The United States Congress designated the North Fork Owyhee Wilderness (map) in 2009 and it now has a total of 43,391 acres. All of this wilderness is located in Idaho and is managed by the Bureau of Land Management. The landscape within the North Fork Owyhee Wilderness, in the southwest part of Idaho near the Oregon border, is diverse, ranging from river canyons over a thousand feet deep to vast expanses of sagebrush and grassland plateaus. Elevations within the Wilderness boundaries range from about 4,800 to 6,800 feet. This ecosystem provides habitat for sage grouse, pronghorn antelope, bighorn sheep, songbirds, raptors, and numerous rare plant species. The river canyons in Owyhee County have been called the largest concentration of sheer-walled volcanic rhyolite and basalt canyons in the western United States. Many of the canyons are more than 1,000 feet deep, nearly twice as deep as the Washington Monument is tall. River enthusiasts come from around the country to challenge the famous white water rapids of these rivers. The area can receive upwards of 4.25 inches of precipitation, annually. Summer temperatures typically range from 40 to 80 degrees F and 25 to 60 degrees in the spring and fall. Winters can become quite cold with average temperatures ranging from 15 to 35 degrees. There are no designated trails in the North Fork Owyhee Wilderness. 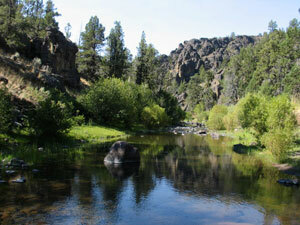 Planning to Visit the North Fork Owyhee Wilderness? How to follow the seven standard Leave No Trace principles differs in different parts of the country (desert vs. Rocky Mountains). Click on any of the principles listed below to learn more about how they apply in the North Fork Owyhee Wilderness.